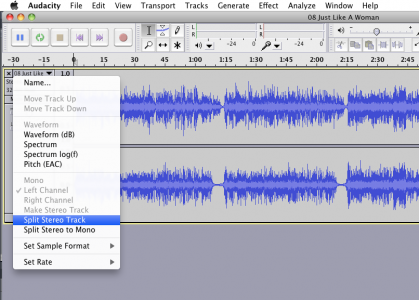 » How to remove vocals from music with phase cancellation you down with FCP? I run into a lot of situations where I put music under an edit and I have vo on top. This combination ends up failing on almost every piece of music that has vocals because it sounds like a trainwreck. Often I will have creatives ask me if I can “turn down the vocals” as if I somehow can pull the multitrack mix out of the low bitrate mp3 that they just emailed me. Bitterness aside, I generally have two options: try to eq the voice out (and often take a significant part of the music with it) or find an instrumental or karaoke version of the track (which is often unavailable or sounds terrible). I was poking around on a dj forum a while ago and found out about a third option! It’s called phase cancellation. Phase cancellation is a relatively simple concept. All sound travels in waves. When two sound waves hit each other they end up combining. Sometimes when the waves combine they make a sound that is as loud as both of them added together and it is called constructive interference. Sometimes they make a sound that is approaching silence and it is called destructive interference. Check out wikipedia for more info. This is the principle behind bose noise canceling headphones. The headphones each have a microphone on the outside of the headphone. They invert the sound wave coming in and then play it back through the speaker on the inside. When the sound from outside and the new sound from the headphone speaker reach your ear both sounds have been silenced by destructive interference. Theory aside, editors are presented with a unique opportunity here. Almost all music is in stereo, and most instruments are recorded in mono. In the mix a fairly common practice is to mix the instruments together into a stereo mix, and then apply the vocals equally to both audio channels. 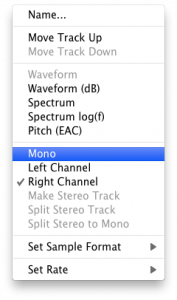 Since the vocals should be equal in each channel, we are able to invert the signal, play it back as dual mono, and reduce or remove the vocal track! 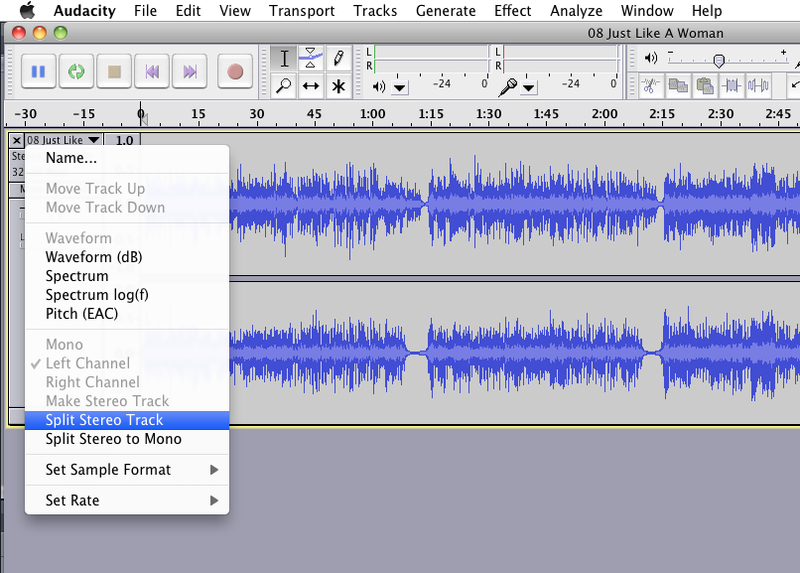 This only works on some tracks (if they were mixed as I described above) and it works best on uncompressed audio files. Try to rip straight from a cd if you can. If all goes well, then when you hit play you will hear a de-vocalized version of the track! Depending on compression, and mixing and your luck you will hear something between a perfect instrumental and exactly what you started with. If your first track doesn’t work; try another, and possibly try something older. Here are the original and de-vocalized versions of a track I tested this with. It’s not perfect, but it will definitely pass if you have a voiceover chugging alongside it. ~ by ross on June 29, 2010. That is simply brilliant!!! Thanks so much for this tip – something that will be a lifesaver at one point or another I am sure of it! Great post! Over the years I’ve found that this is hit-or-miss, particularly with pop music that has stereo effects applied to the vocals. One problem with the basic phase-cancellation method is that you also lose most, if not all of the kick and snare drums, and bass guitar. That’s where you go a step further and take the un-effected music, apply a low-pass (high-cut) filter to it, then mix that track with your phase-canceled track to put most of the kick drum and bass guitar back in. You can also try adding a stereo high-pass (low-cut) filtered track to the mix to give the song it’s spacial effects back (and get some of that snare back too). You basically end up phase-canceling only the vocal frequencies while leaving the stereo image and low-frequency information mostly intact. Shotgun mics also work by using phase cancellation. They cancel out the off-axis sounds while leaving the on-axis sounds untouched. This is why they can’t be used for interior shots, because the dialog you need to capture is also being phase-canceled by its reflections off the walls, floor, and ceiling (that are hitting the shotgun mic from its sides). I agree Tim, this works well sometimes and yields garbage other times. It is not as good as finding a legit instrumental version, but it is a great tool to have when you are in a pinch. Tried the same in Soundtrack, and works there as well – just that you can’t split the stereo file unless you take additional steps. But holding down the ‘Command-Key’ you can simply mark one channel, invert it (plus any desired Pro-Audio Filters for preserving more ‘edges’) and then convert the whole file to mono (both in the ‘process’-menu. i wonder if there is a way to perform the reverse operation? say, if you wanted to create (for some reason) a vocal only track of a song, or to isolate voices from a mixed spot or movie for a cut down. 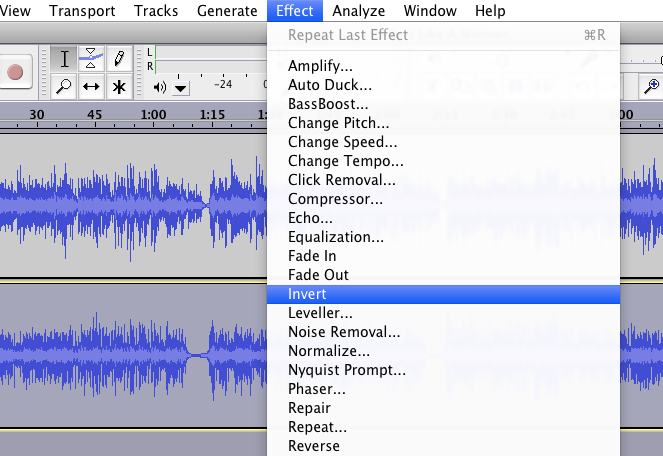 common sense would suggest that if you can remove the vocals, you should be able to remove everything else. however, the simplicity of this operation confuses me slightly. RC/Ross– I’ve done this method to isolate dialogue tracks in movies, which are usually mixed the same way (center channel). It’s exactly what Ross said. Remove the vocals/dialogue with the inverted track, then invert that and apply it to the original track to remove everything BUT the vocals/dialogue. MAGIC. You’re happy with your result sounding like mono instead of stereo? if this technique works, then it was mono to start with. don’t fool yourself.